Did Barron Trump roll his eyes when dad Donald Trump talked about parenting? Everyone has been talking about the results of the election on November 8 when Donald Trump took a shocking victory over Hillary Clinton, but little has been said about who was standing by The Donald's side when he accepted the victory -- his son, Barron Trump. The 10-year-old flanked Trump during his acceptance speech and despite his dad's infamous bellowing speeches, Barron might have been the most overlooked yet entertaining part of the evening. 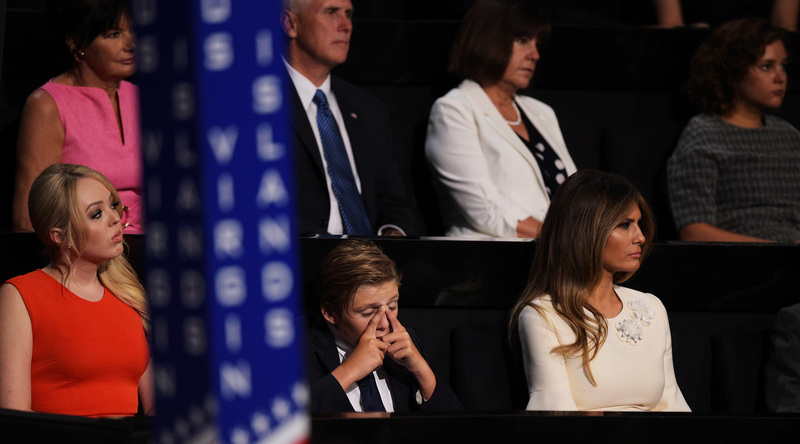 During his dad's acceptance speech, Barron gave him the old "slow-clap" as Trump talked about how much his parents meant to him about 6:30 into the speech. "First, I want to thank my parents, who I know are looking down on me right now. Great people. I've learned so much from them. They were wonderful in every regard. Truly great parents," Trump said. Now look right at Barron's face. The young kid gives his dad a couple sub-standard claps and then his eyes get wide and, wait for it, eye roll. Admittedly, it was a very late evening for the kid and he was probably exhausted. As you can see, the timestamp on the speech was nearly 3 AM EST, meaning it was probably way past his bedtime. Nonetheless, the dapper kid's display of lackluster affection for his new presidential pop was pretty entertaining. This isn't the first time Barron looked bored out of his mind either. During the Republican National Convention, the cute kiddo was spotted yawning and falling asleep. Plus -- fun fact -- Barron will be the first son living in the White House since John Kennedy in the 1960s, so we feel he's entitled to a couple slow caps. He'll likely be a big name of his own.